U.S. Senator Cory Booker, U.S. Senator Robert Menendez and Congressman Bill Pascrell, Jr. joined together for a press conference at St. Joseph’s University Medical Center in April to address new legislation – The Alternatives to Opioids (ALTO®) in the Emergency Department Act – a bill that calls for setting national protocols for hospitals across the country in the fight against the opioid epidemic. The bill is based on our highly successful ALTO® program – implemented at St. Joseph’s in 2016. “More often than not, it’s people in pain getting hooked on painkillers in their own medicine cabinets, prescribed by their own doctors that lead to addiction — Percocet, OxyContin, Vicodin and others. Four out of five new heroin users started out initially misusing pain pills,” said Senator Bob Menendez. “St. 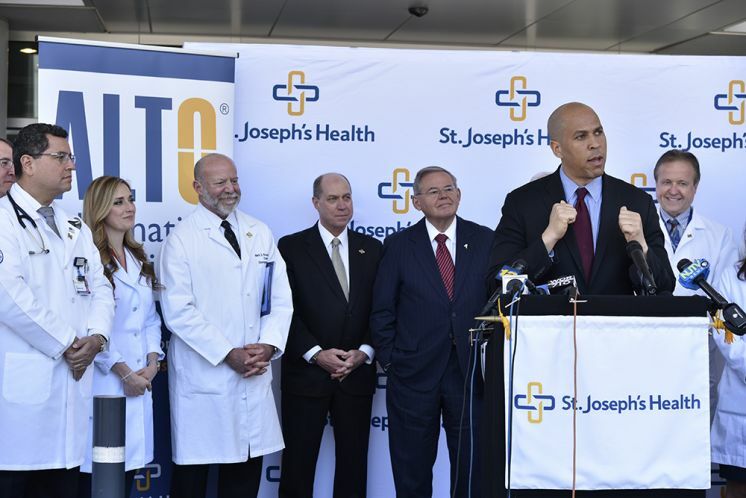 Joseph’s is providing emergency rooms across the country with a blueprint for preventing countless overdoses from happening in the first place,” added Congressman Bill Pascrell. The Alternatives to Opioids (ALTO®) program uses targeted non-opioid medications, trigger point injections, nitrous oxide, and ultrasound guided nerve blocks to tailor its patients’ pain management needs and avoid opioids whenever possible, for example, in cases of kidney stones, acute low back pain, broken bones, acute headache and migraine pain. The ALTO® program has gained interest from other hospitals and healthcare systems across the United States and the world, including Turkey, Israel and Switzerland, who are interested in replicating the model program.